Vejer de la Frontera is one of the most picturesque white villages in the Andalusian Sierra. Additionally to its viewpoint character and its clearly visible origins as a fortress on the top of a steep hill, there is another characteristic feature. The village has three valleys reaching up into the historical centre in which the surrounding landscape mix with the urban structure as they reach the top of the hill. They are a natural entrance of the surrounding landscape into the old fortress. Logically these served as main access routes, each one with a different character. In our proposal we maintain this difference, making it the base for a new accessibility concept. The proposal is based on a double ring concept for different modes of transport. The motorised traffic arriving in Vejer is filtered in the entrance hub in the north valley. Buses and non-residents may continue on the main exit road or leave the car on one of the over 300 parking spaces. They will not have the possibility to enter the centre of the historical village. This restriction policy combined with the one-way-distributor-ring-road concept for residents is the base to achieve the main goal of keeping the motorised traffic out of the historic centre. The ring road will be equipped with adequate walkways inviting for a stroll around the centre to enjoy the views on the surrounding landscape. 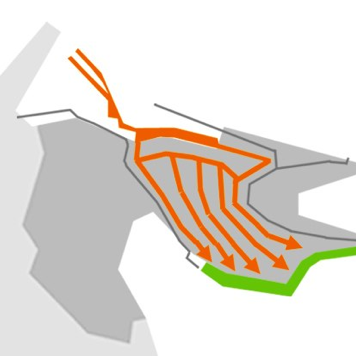 The construction work of a new green belt can be used to locate a new drainage system to capture and store rainwater for irrigation of the green zones, separating used-water and rain water-management. On the outside of the retaining walls of the village we establish a second level of walkways and bike-paths linked to leisure uses. This offers space to develop recreational areas with fitness equipment, picnic sites, climbing facilities in the perimeter wall and bike routes around Vejer. A new pedestrian zone on the city balcony next to the entrance, which served as one of the main entrances for motorised traffic in former times, serves as a starting point invites for a stroll through the narrow village. 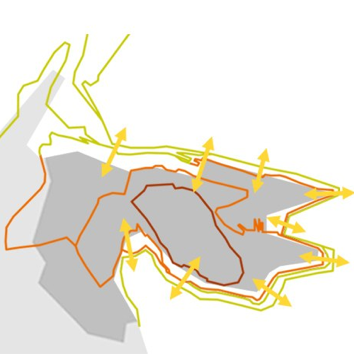 Possible Walking routes between the entrance in the north and the new linear parking in the southeast generates a kind of "comb" of pedestrian routes trough the inner centre with very little interference from cars, liberating the city life and orienting the whole village more in the direction of its landscape. 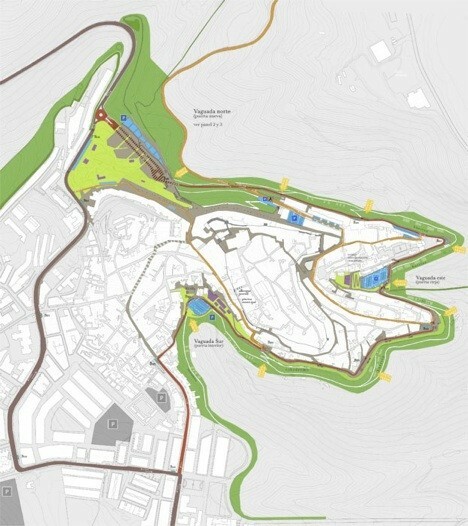 On the other hand we propose access points from the landscape oriented green belt into the inner centre. The so called green points serve as vertical communication between different levels of the ring and as pedestrian access between the landscape and the historical centre. These points are easily accessible which makes them ideal places to offer added functionality like bus stops for the circular bus, well designed rubbish collection facilities and access points to the rain water reserve for irrigation. To make them clearly visible and recognisable from the inside they would be marked by green zones reaching from the green belt into the city centre.